The explainer video industry is growing at a faster pace than ever before. Earlier, visual content was restricted to TV, Facebook, Instagram, and Twitter, but with the arrival of new marketing strategies, visual content has got a new form, and we call it explainer videos. Animated explainers provide a great result as you get a platform to explain that you understand viewers’ problems and have a solution to them. Moreover, they are a good source of education media because of snappy animations, narrative audio, and eye-catching visuals which engage a viewer to the end. These are the essentials for a perfect video that gives you the best experience in the marketing world. Global companies are constantly making these videos part of their brand development while explaining various industries such as health, travel, tech and science, fashion, food, film etc., their products and services in an efficient way. You can advertise anything on the web with an explainer video! With the growth of the animation industry, the demand for video production companies has risen that leads to fierce competition in the realm of visual marketing. The preference for animated marketing videos in various industries has given an edge to explainer animation as a gateway to developing brand proposition. An unexplained level of creativity, eye-striking graphics, and new animation styles are the essentials to establish a signature amongst competitors through videos. At the core, an animated explainer video is an art of presenting a particular business in two to three minutes. This is probably not easy; it requires the experience of playing with characters without forgetting the end goal of keeping a viewer intact to the end. If you are a beginner and want to try this marketing strategy, make sure you have complete knowledge of video types including their salient points. This post explains different types of marketing videos and what makes one different from other. Animated Explainer videos have a significant share of success when it comes to marketing. It is an ideal way of presenting services, intangible products, for example, software to your audience. When you offer a few services or your software has a few physical features, a live-action video will not bring worth as it is particularly used to describe a large number of services simultaneously. Despite allowing for the highest level of creativity in the concept of the video, animated explainer videos are easy to update than live-action video. Flexibility is what you attain with this which further helps accommodate anticipated future changes regarding any product or service. Over the past few years, Whiteboard style videos have gained hype, particularly in the online marketing and startup companies. This type of videos includes a voice over followed by a series of text and images that look like written on a whiteboard. 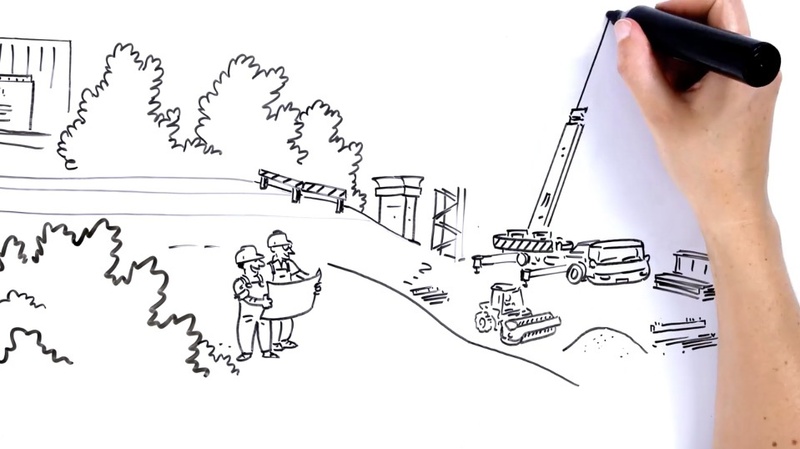 Want to make your Whiteboard Explainer Videos memorable? Go for a simple visual format along with a clear voice over to generate an everlasting experience. Infographics are a graphical representation of products, services, etc. An infographic style video works best when you have a lot of numbers and statistics to share with your target audience. Moreover, you can present illustrations, graphs and flowcharts in a simple yet informative way. Being an animation technique, it can make physical objects appear to move by changing the position of objects in tiny movements amongst different frames. No sooner are the frames played in a continuous sequence, a viewer gets an illusion of movement. Moreover, you can use plasticine figures for a Stop motion video. Claymation is another name of stop-motion videos. This is a recent and popular technique. Its prominent use in the commercial sector due to its high quality and state-of-the-art feel has given a number of brands noticed a recognized presence among their competitors. Furthermore, it facilitates a viewer to rotate and zoom into all the elements in the video and get better know-how of associated brand. However, the production of 3D animations might sound expensive to you if you have a small budget. Even if you have a budget for this type of video, get ready for longer production time as this type of video usually involves changes or adjustments and consumes more time compared with other styles. If you are looking for a way to connect with your audience on a personal level, a live-action video is a perfect solution. How does it help on a personal note? It facilitates you to show what’s going on behind the scenes at your company, or have a one-on-one conversation with you CFOs. Moreover, you will be able to connect the audience on an emotional level as you will show real faces that build trust and humanize the people behind your organization. This type of videos is also useful for testimonials as your prospects will see that real people have used your products. Bonus tip: Demonstrating thought leadership requires the use of real people, particularly if they are names your industry knows them. The basic idea behind this animation is to convey a message through words. You would easily get tons of examples of this type of video on the Internet. As the name suggests, this type of explainer video depends upon text and number. When a relevant animation is followed by background music that syncs with your ad, you get a generic way to connect with your users. This type of video has the power to convince someone’s mind, express your concern and way of thinking that moves people’s feelings. 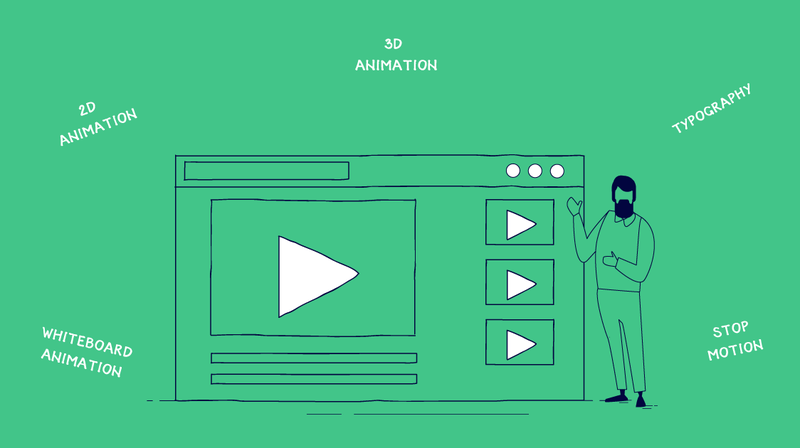 This post has given you a more comprehensive view of the animation world with different video types you can opt to drive your business strategies. Understanding and implementing the ideas mentioned above can help make a killer video that is effective enough to promote your brand and strengthen your business as well. Pick the best option as per your requirements and get ready to make your conversions touch the sky!